I think it's a pretty well-established law of the universe that everything's better with giant robots - no matter what activity you're referring to. For that reason, I'm actually pretty excited to hear that there's a team twenty engineers, scientists, artists, designers, fabricators, and producers down in the States that's looking to introduce a new kind of paintball game - one involving giant humanoid robots. Yes, you read that right - it's a game of paintball with Mechs. If you don't think that's awesome, then your inner child is probably dead. The robots have been christened MegaBots. Standing at fifteen feet tall, each walking machine weighs around 15,000 pounds, and is tipped with pneumatic guns capable of firing three pound paintballs at speeds of up to 120 miles per hour. Now, here's where it gets really cool. Instead of just getting, say, stained with paint, the robots actually simulate structural damage. Each MegaBot is clad in customizable armor plating that breaks off when it takes a hit. An internal computer keeps track of which pieces of armor are missing and causes the robot to lose limbs, limp, make noise, and jam its weapons as it starts accruing greater damage. So...basically, it's probably the closest any of us is ever going to get to being in a real-life robot fight. In order to help them fund their MegaBots venture, the team's put the giant machines at the center of a Kickstarter campaign, which seeks to raise $1.8 million in order to construct two of the devices (I'd imagine more are likely to follow in the future). Currently, the team is working on its prototypes and finalizing the design - they've so far constructed a prototype gun emplacement, weapons systems, arm, and upper body. As for why the 'bots are so expensive? This is pretty much bleeding-edge tech here. The team's currently involved in the development of "battery-powered miniature electro-hydraulic power plants," oversized paintball ammunition, air cannons, and walking algorithms that'll allow the two machines to navigate around obstacles. So, yeah - not exactly easy. Ultimately, the MegaBots team wants their invention to form the basis of an entirely new competitive sport. They envision professional leagues in which MegaBots face off against one another; full-fledged tournaments which pit pilot against pilot along with vehicles, obstacles, and AI. They hope to run the very first competition in May of 2016 - ambitious, to be sure...but awesome if they manage to pull it off. The Kickstarter runs until November 28 - donate to it here. Unfortunately, it's currently only raised $49,000 of its $1,800,000 goal. Here's hoping it manages to make up the difference by the time the campaign ends. Because let's be honest...who doesn't want to see two giant robots duking it out? 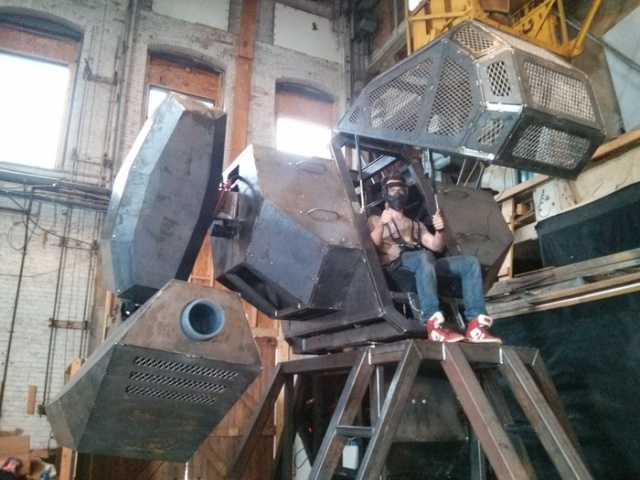 You can check out a video of the MegaBots prototype in action below.